The Cruiser U.S.S. BALTIMORE saw much interesting duty before, during and after the Spanish-American War. In 1898, she served with the United States Asiatic Squadron under Commodore Dewey and took part in the Battle of Manila Bay on May 1. She was the second largest vessel in George Dewey's fleet, surpassed only by the flagship, USFS OLYMPIA. During the first half of the battle, the U.S.S. BALTIMORE was the second ship in Asiatic Squadron's line of battle. In the later part of the action, the she led the attack, having a duel with Spanish shore batteries. At Manila Bay, BALTIMORE suffered two officers and six men wounded by a single shell which riccochetted around the weather deck, hitting and exploding some ammunition. These were Dewey's only casualties during the battle and all recovered from their wounds. The following day, U.S.S. BALTIMORE and USS RALEIGH went to demand the surrender of the batteries on the island Corregidor at the entrance to Manila Bay. U.S.S. BALTIMORE was launched on October 6, 1888, being sponsored by Mrs. Theodore D. Wilson, the wife of the Chief Naval Constructor. The vessel's commander upon commissioning was Captain (later Rear Admiral ) Winfield Scott Schley, who gained fame at the Battle of Santiago in the Spanish American War. BALTIMORE became flagship of the North Atlantic Squadron in May, 1890. That August, she conveyed the remains of the late Captain John Ericsson, inventor of U.S.S. MONITOR, from New York to Stockholm, Sweden. After a cruise in European and Mediterranean waters, she was transfered to the South Pacific Station. A revolution was ongoing in Chile, where Americans were not well-liked due to U.S. support of the government against the rebels, and previous support for Peru and Bolivia in a bitter border dispute. U.S.S. BALTIMORE arrived in Valparaiso on April 7, 1891. The rebels were successful, and the government collapsed in August of that year. BALTIMORE stayed in Chilean waters, and, as the city seemed quiet after the end of the Revolution, Schley unwisely let American sailors go ashore on October 16. What happened that night has never been agreed upon by the two nations. Chile claims the Americans got drunk, fights ensued and the local forces came out to break up the riots. The U.S. says there was an organized effort on the part of the local government and police to attack the sailors, in retribution for earlier actions of the American government. Regardless, two BALTIMORE sailors were killed, and many more were wounded. The spectre of war loomed. Eventually, Schley and BALTIMORE sailed out of Valparaiso, where "Fighting Bob" Evans and U.S.S. YORKTOWN remained to help ease the situation. U.S.S. BALTIMORE arrived at San Francisco on January 5, 1892. She steamed off the west coast until being ordered back to the eastern seaboard. She took part in the Hampton Roads Naval Review, and was then sent to the Asiatic Squadron via the Suez Canal. BALTIMORE was flagship of the squadron from December 22, 1893 until December 3, 1895. Early in 1896 she returned to San Francisco, and was decommissioned at Mare Island on February 17. In October 1897, BALTIMORE sailed to the Hawaiian Islands and remained there until March, 1898. As the Spanish American War became imminent, ammunition was shipped to Honolulu via the U.S.S. MOHICAN and transferred to BALTIMORE. She transported the ammunition to Dewey, arriving only 48 hours before the squadron had to abandon Hong Kong. Due to Dewey's careful planning, in those two days BALTIMORE was repainted in wartime colors and dry docked, her hull being cleaned to increase her speed. She travelled to Mirs Bay with the rest of the Asiatic Squadron, finally transferring her badly needed ammunition to the other vessels on the day war with Spain was declared. From Mirs Bay the squadron sailed for the Philippines and, on the morning of May 1, it entered Manila Bay and destroyed Admiral Montojo's Spanish Fleet. Following the American success at the Battle of Manila Bay, U.S.S. BALTIMORE remained in the Philippines. During the final attack on Manila, which resulted in the city's surrender, BALTIMORE was located off of the famous Luneta Battery. BALTIMORE remained on the Asiatic Station, convoying transports and protecting American interests, until May, 1900, when she sailed for the United States via the Suez Canal, arriving at New York September 8th. On September 27, she was decommissioned. Recommissioned on May 6, 1903, BALTIMORE was assugned to the Caribbean Squadron, North Atlantic Fleet. She took part in summer maneuvers off the coast of Maine and in the Presidential Review at Oyster Bay, N.Y. in August, 1903. Later that year, she was at Santo Domingo. In the summer of 1904 BALTIMORE was attached to the European Squadron and cruised in the Mediterranean. In September she sailed from Genoa, Italy for the Asiatic Station and spent the next two year cruising in East Asian, Philippine, and Australian waters. BALTIMORE returned to New York in April 1907, and went out of commission. In January 1911, she was placed in commissioned reserve and served as a receiving ship at Charleston Navy Yard . During 1913-14 she was converted to a minelayer at Charleston and was recommissioned in March, 1915. During 1915-16 she carried out mining experiments and operations in Chesapeake Bay and along the Atlantic coast. When the US entered World War I, BALTIMORE was training personnel. In March, 1918 she was detailed to assist in laying a deep mine field off Ireland. Between April 13 and May 2, she laid approximately 900 mines in the North Channel. In June BALTIMORE joined Mine Squadron One at Inverness, Scotland. For four months she participated in laying the Northern Mine Barrage. In September, BALTIMORE sailed for the United States. She carried out mine experiments near the Virgin Islands until the end of the year. In September 1919 she joined the Pacific Fleet and remained on the west coast until January 1921. She then proceeded to Pearl Harbor, where she was placed out of commission in September 1922 and sold for scrap in February 1942. USS BALTIMORE was a good basic design, far superior to any vessel of Admiral Montojo's Squadron. 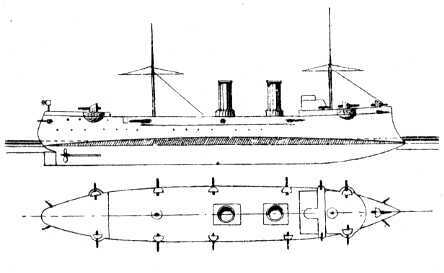 But by 1898 her armament, by international standards, was considered undersized and her protection was behind the current state of naval design. One 3 inch field piece (for landing parties). William Cramp and Sons, Philadelphia, Pa.
Horizontal triple-expansion engines, 10,064 hp. 2 shafts. slopes and 2 ½ " on the flat (top), 2" gun protection. Clerk of the Joint Committee on Printing, "The Abridgement of the Message from the President of the United States to the Two Houses of Congress", Washington DC: Government Printing Office, 1899. Naval History Department, Department of the Navy, "Dictionary of American Naval Fighting Ships", Washington DC: Government Printing Office, 1959.